Each day leading up to the trip, I also checked out Hotel Tonight, searching for hotels in Vegas, but also triangulating my expectations by checking Honolulu and San Francisco, cities where I had a good feeling for the quality and pricing of many hotels. If you’re not familiar, Hotel Tonight (HT) offers deals for, you guessed it, hotels with a check-in availability of tonight. If I remember correctly, HT began on the premise of giving hotels one final outlet for unused rooms. Or, if you were in need of a last-minute room, or if you liked traveling by the seat of your pants, then HT offered the potential for an amazing deal. In the days leading up to CES, the deals on HT looked pretty sweet. Rooms at the Hard Rock were in the $60/nt range, and higher-end hotels, like THEHotel, Vdira, and Aria, were under $200. Some of HT’s deals were only for a single night, while others allowed up to four nights. And, some offered multiple nights with varying prices each night. Being in need of four nights during one of the biggest events in Vegas, and knowing that many hotels were either totally sold out or charging top-end rates, I decided to roll the dice and give HT a chance. What’s the worst that could happen? Given that Vegas has somewhere around 150,000 hotel rooms, I figured that, if I didn’t have any luck with HT, I’d be able to get something off, off Strip for a reasonable price, even on the same day. One thing caused me some worry, however: HT deals go live at noon local time, and I’d be in the air until a bit after 2:45 PM Vegas time. Not good, especially if anyone else was considering the same plan. Also, I’m assuming that most hotels only offered up a limited number of rooms at HT’s discount price, so the “good” deals would be snapped up before I had access. On the day before my departure, Vegas deals on HT didn’t look so great. Prices were higher and options were slim. I considered a few online deals from other travel sites, like the Luxor for $170/nt, but the sense of adventure (yeah, this is adventure for me) pushed me to take the risk and see what happens. Scrolling further, there were a few off-Strip deals for $47 to $120, and then the “Bonus Luxe Hotel” of Encore at Wynn for only $699, which was $100 cheaper than I’d been seeing it online the previous week (but still about 3x my price ceiling). 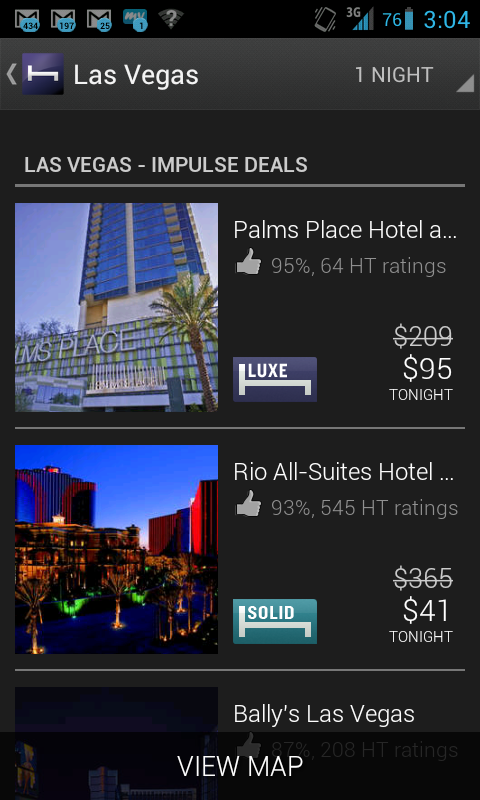 HT also listed Palms Place as a “Luxe Impulse Deal” (whatever that is) at only $95 for one night, or $167/nt for two nights. It was off-Strip, but after seeing the word “luxe,” and knowing that it was near a restaurant I wanted to try, I dug deeper. It had a 95% “thumbs up” rating and Wifi was free – something for which the cheaper hotels charged up to and additional $25/night. Although every hotel seemed to charge a $20-30 “resort fee,” which sometimes included WiFi. 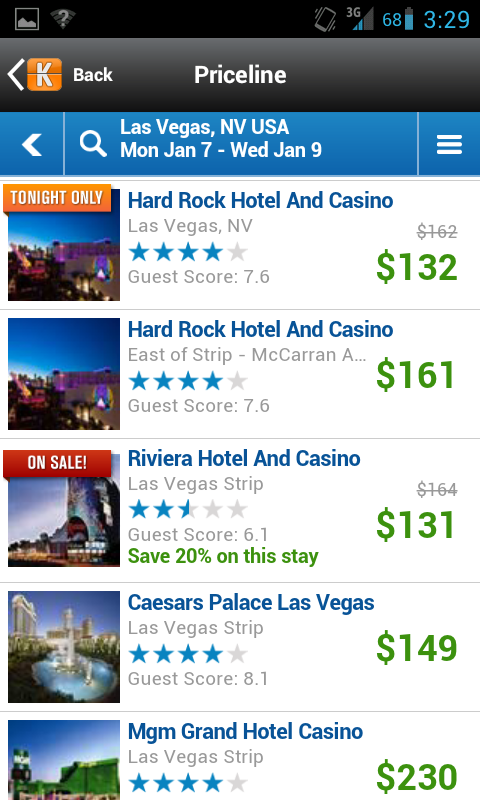 As a quick check, I looked at the rate for Palms Place on Kayak, Trip Advisor, and Priceline. I should note that Priceline directly competes with HT by offering “Tonight-Only Deals,” but like HT, the deals are only available via their smartphone app. No other service appears to offer a similar tonight-only deal. And, unlike HT, which offers multiple hotels, Priceline appears to offer only a single “tonight-only” deal. For Palms Place specifically, the cost was $167/nt on HT (for 2 nights). 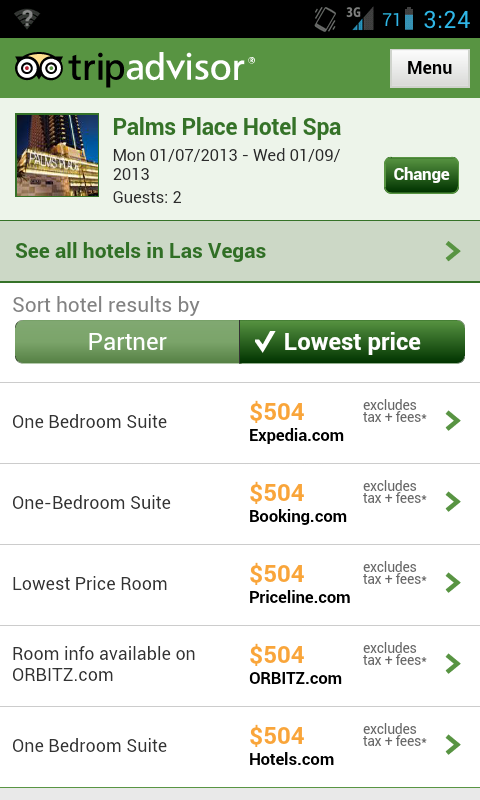 Trip Advisor’s app, which lists prices from several services, showed an astronomical $504/nt (for 2 nights). And Kayak, which is usually my go-to travel planning service, along with Hipmonk, listed Palms Place at $403/nt. HT was going to save me over $230/nt! 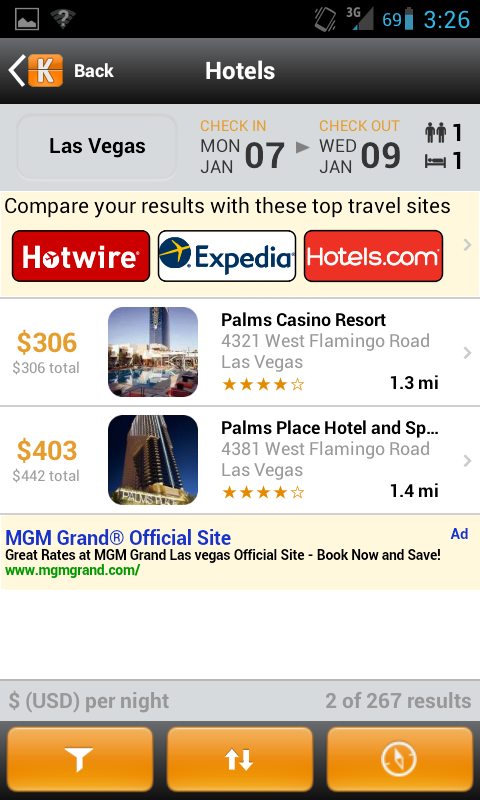 Even if you don’t use HT, it’s surprising how widely the prices ranged for the same hotel across different websites. Regardless of how far out you’re planning, it obviously pays to shop around. Since the Palms Place per-night average doubled to $198/nt if I stayed 3 nights, I decided to take this little experiment further and double-down on HT. So I grabbed Palms Place for two nights at $167/nt average, then used HT again midweek to see if I could upgrade to something nicer, cheaper, or on the strip. As an aside, Palms Place was pretty nice, and definitely worth the price. It’s a residence property, with only some rooms offered as hotel rooms, and seemed virtually empty. I hardly ever saw anyone else, and even the adjoining Palms hotel and casino seemed deserted. And, the on-site N9NE Steakhouse was amazing! The only downside was the $12 taxi ride to and from the strip, since there’s nothing worthwhile within walking distance of the Palms properties. By mid-week, I was ready to try something new and had been checking HT frequently to see which way prices were trending. Every service showed very high prices on Wednesday and Thursday nights, since that was smack in the middle of CES. But, I was hoping that there would be some last-minute cancellations or adjustments that would open up some deals on HT. The Hard Rock Hotel seems to be a frequent HT property, and I’d heard a lot about it and was curious to try it. At noon on Wednesday, HT showed the Hard Rock at $90/nt, so my gamble paid off! HT lists the Hard Rock as “hip,” and it is pretty neat to see all of the rock memorabila around the hotel. The place seemed a bit more crowded than the Palms, but was relatively quiet–except for the loud plumbing (I could hear every flush and shower from adjoining rooms) and the fact that it’s located on the airport’s flight path. I’m definitely older than the Hard Rock’s target demographic, so am probably a bit more critical than their typical guest, but they could stand to slap some paint on the walls and hit the carpeting with a vacuum more frequently. Upon checking out of a HT-booked hotel, the app asks you for a thumbs up or down rating. Given the state of the hotel vs. my expectations, I gave it a thumbs down. However, at $90/nt, it was definitely a good deal…I just wouldn’t stay there again. At Palms Place, HT charged me the advertised room rate, plus taxes. When I checked out of the hotel, Palms Place only charged me the resort fee. At the Hard Rock, however, I was not only billed for a higher room rate at checkout, but the hotel listed my HT credit as only $116 instead of the actual $202. I didn’t bicker with the hotel staff, since they didn’t know anything, and HT asks users to call them before calling the hotel. On the contrary, when I’ve had to deal with customer service at AT&T or Time-Warner, it’s been they typical slow, backwards, company-centric nightmare that we’ve all come to expect from most corporations. With HT, I called their support line on a Saturday and was greeted by a friendly rep who took my info, said that she would take care of the issue, and promised to call me back when it was resolved. Even more, the rep asked me about my “thumbs down” rating on Hard Rock and mentioned that they try to always follow up on poor ratings, either via phone or email. That’s pretty good service, and makes me think that HT has really integrated customer service into their organizations as part of their culture. They don’t seem to be outsourced reps or just blindly following a script; they are knowledgeable efficient, and seem genuinely concerned about the customer’s happiness. How refreshing! As promised, an HT rep called me a few days later, said that everything was squared away, and that I’d be seeing adjustments on my credit card statement within a few days. Done. So what do I think of Hotel Tonight? In a word, it’s awesome! I got two fantastic deals, saving probably $600 or more over four nights (or, getting much nicer hotels for the price). For the city to which you’re traveling, check Hotel Tonight right now, and check it daily for a few days. Get a good look at the hotels they work with, see if several appear again and again, and see if you’re comfortable staying at most of those that are frequently listed. Check several other services to gauge the book-ahead prices. Start narrowing down your list of potential hotels to three or four listed on HT, and keep comparing prices. On the day of your stay, get on HT right at noon (destination time) and book quickly. Be prepared to take your second or third choice. And, check Priceline’s “Tonight-only deal,” just to be sure you’re getting the best deal. Upon checkout, make sure you aren’t charged for the room or the taxes, but only the extras.